With a staggering number of papers published in the past several years involving the characterization and use of the CRISPR/Cas9 gene editing system, it is surprising that researchers are still finding new features of the versatile molecular scissor enzyme. Now, a collaborative team of scientists led by researchers at the Max Planck Institute and a co-discoverer of CRISPR’s genome editing capabilities has uncovered a feature of the CRISPR-associated protein Cpf1 that has previously not been observed in this family of enzymes—dual RNA and DNA cleavage activity. In the CRISPR/Cas9 system, the enzyme Cas9 cuts viral DNA at a location specified by an RNA molecule—the CRISPR RNA (crRNA)—in complex with another RNA, the so-called tracrRNA. This is the bacterial version of an immune system and helps put pathogens out of action. In contrast to CRISPR/Cas9, Cpf1 can process the pre-crRNA on its own, and then using the processed RNA to target and cut DNAspecifically. Not requiring a host-derived RNase and the tracrRNA makes this the most minimalistic CRISPR immune system yet. The mechanism of combining two separate catalytic modalities in one allows for possible new avenues for sequence specific genome engineering, most importantly facilitation of targeting multiple sites at once or multiplexing. Previous work from the Max Planck team described a system that consists of two RNAs forming a duplex (tracrRNA and pre-crRNA), with tracrRNA maturing pre-crRNA to crRNA, in the presence of the protein Cas9. Moreover, the research group demonstrated that tracrRNA and crRNA together, either in the form of the duplex of two guide RNAs or a fused single guide RNA, are required to guide the Cas9 enzyme accurately to the matching target DNA sequence—outlining the molecular mechanisms of the primary CRISPR/Cas9 system. “Although the workings of CRISPR/Cas9 sound simple, the details of the mechanisms involved are rather subtle,” explained senior study author Emmanuelle Charpentier, Ph.D., director at the Max Planck Institute for Infection Biology and co-discoverer of CRISPR/Cas9’s role in genome editing. Additionally, the scientists discovered that the CRISPR/Cpf1 system does require enzymes like RNase III and is not depending on the help of a tracrRNA molecule to reach its destination. Consequently, it is even simpler in structure than CRISPR/Cas9. 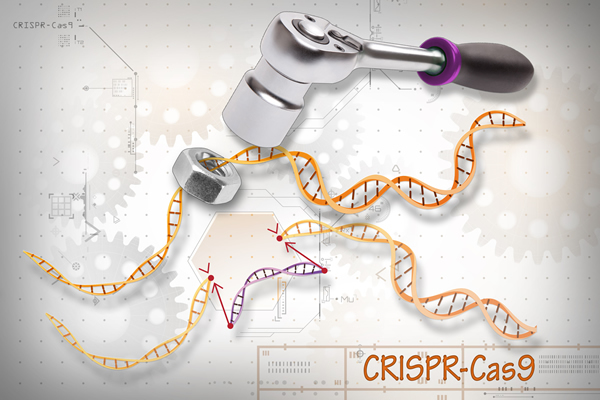 “CRISPR/Cpf1 is a plug-and-play system with no additional component needed. In contrast, CRISPR/Cas9 needs in its natural setting an assistant to activate the system,” Dr. Charpentier stated.